7th January 2019, New Delhi: Patients and their family members might have something to cheer about soon. The GST Council in it's upcoming meeting might make it mandatory for hospitals to bill medicines and hospitalisation charges separately. This move will not only plug leakage in GST collection from healthcare providers but will benefit the consumers in many other ways by making the billing system transparent. 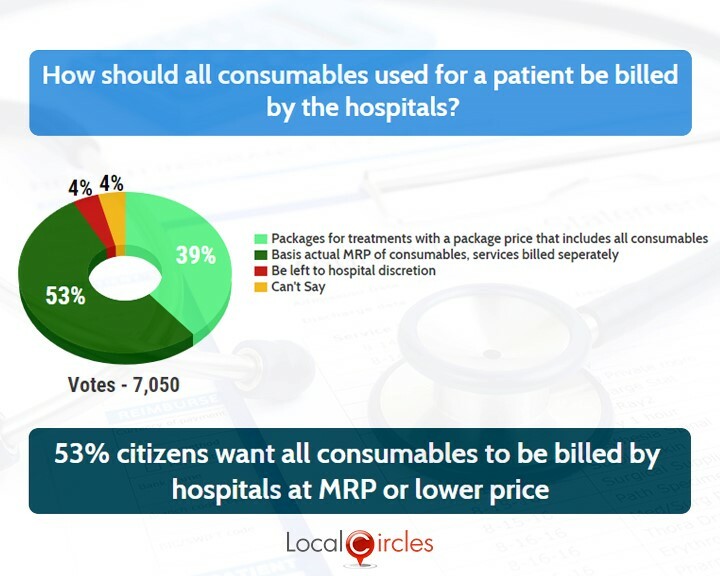 Last year, citizens through LocalCircles’ polls had made various demands to the government to improve the working of the healthcare sector in India. One of the demands was that the medicines used for a patient, and services used should be billed separately to ensure that patients understand what they are paying for. Although one consumer demand is close to being accepted, there are some others on which action is still awaited. The results show that citizens want the government to make regulations that are oriented towards the citizens and enforce them tightly. With many state governments in the process of enforcing the Clinical Establishment Act, it is all the more important that citizens ask are listened to. There are five other citizen demands that came to light through LocalCircles’ polls. 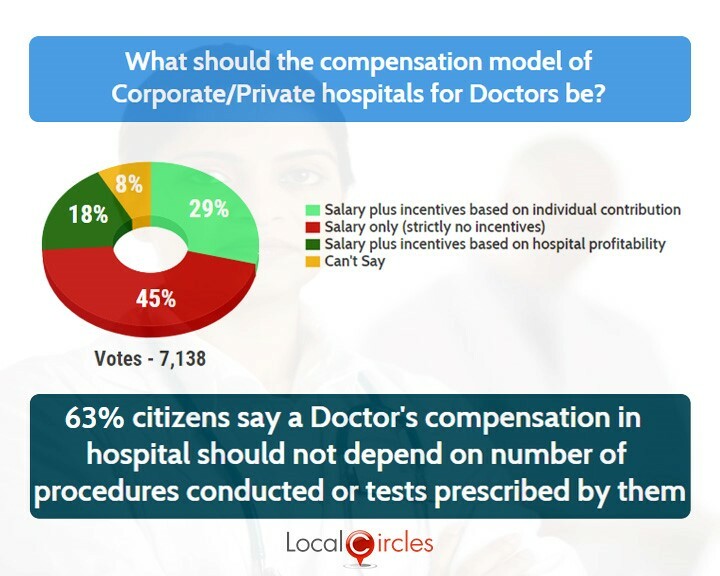 The first poll asked citizens what the compensation model of private hospitals for doctors should be. 45% said they should be on salary only with strictly no incentives, 29% said they should be on salary plus incentives based on individual contribution, 18% said they should get salary plus incentives based on hospital profitability and 8% could not decide how it should be done. Many citizens had reported that doctors are given financial targets by hospitals and are incentivised every month for achieving them. This leads to doctors unnecessarily prescribing tests and medicines to the patients, thereby increasing their bills by many folds. Next question asked what the doctors should be doing when it comes to prescribing medicines. 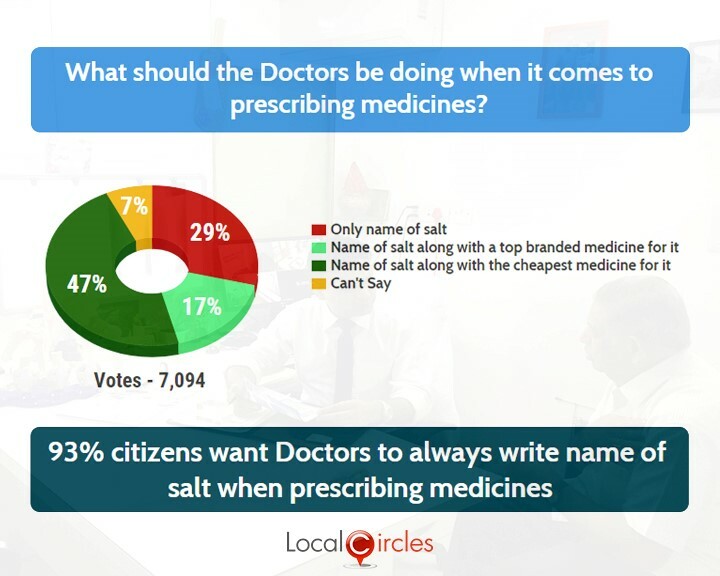 29% said they should only name the salt, 17% said they should name the salt along with the top brand medicine with it, 47% said they should name the salt along with the cheapest medicine with it and 7% said they were not sure what should be done. It has been reported that some pharmaceutical companies bribe doctors in form of gifts and holidays so that they prescribe their medicines to the patients, even if there are cheaper alternatives available in the market. 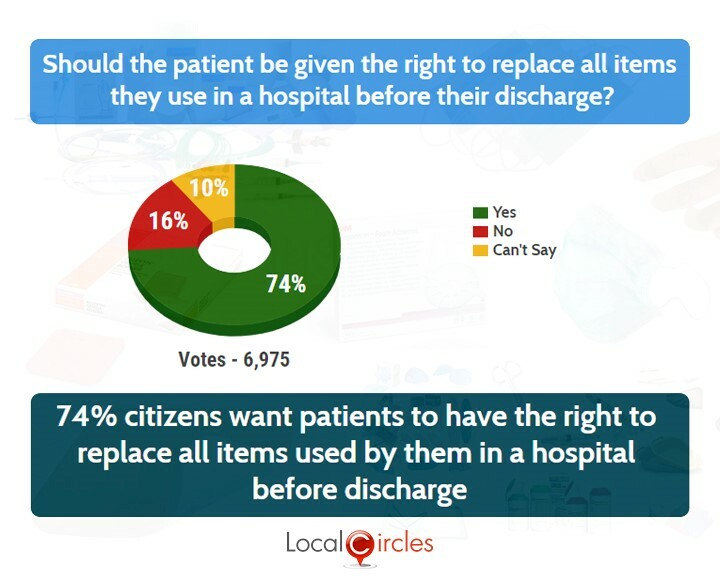 When asked if the patients should be given the right to replace all items they use in a hospital before discharge, 74% agreed with it and 16% disagreed with it. 10% remained unsure. 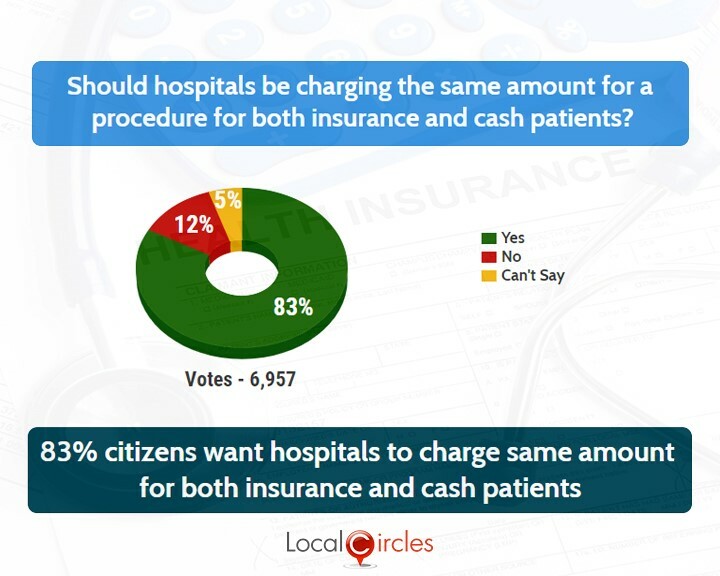 Following poll asked if hospitals should be charging the same amount for a procedure for both insurance and cash patients. 83% agreed with it and 12% disagreed with it. The government has made some rules to protect the patient’s interest, but they are poorly enforced. Hospitals find ways to play with the rules to increase their profit margins. 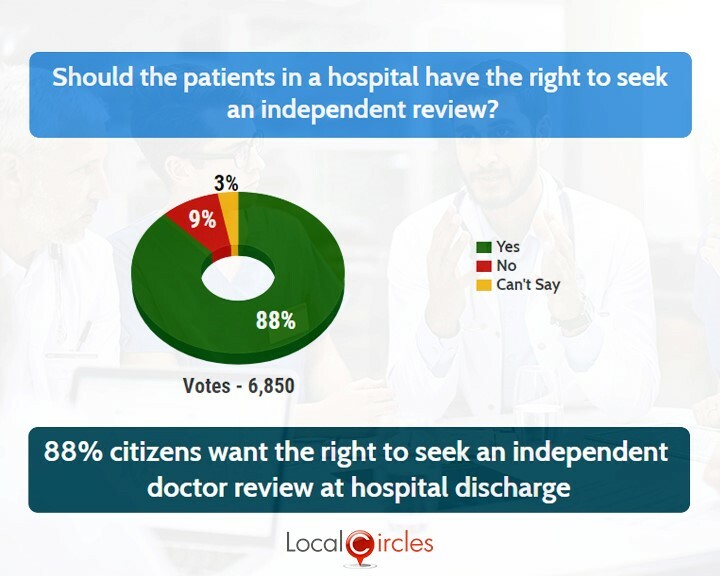 On the question if the patients in a hospital the right have to seek an independent review, 88% responded in an affirmative and only 9% responded in a negative. 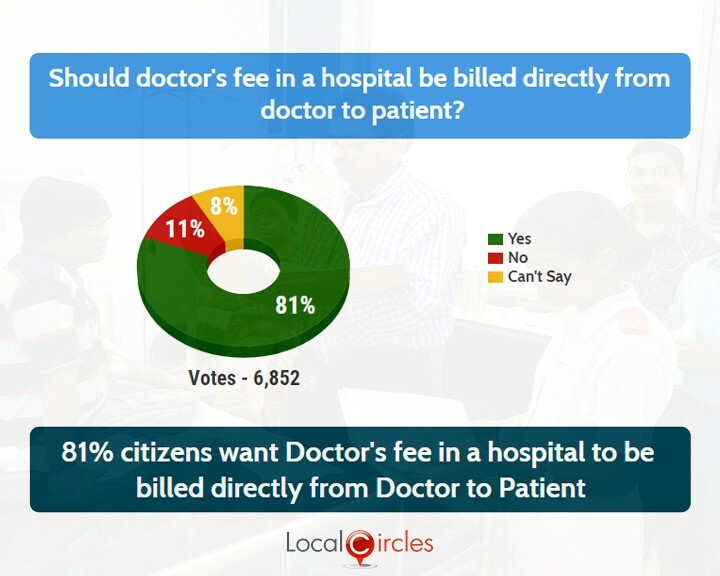 The last poll asked if the doctor’s fee in a hospital should be billed directly from doctors to patient. 81% said it was a good idea whereas 11% voted against it. India’s healthcare system is fragile. Along with making new rules and regulations, NMC should also make sure that they are enforced well so that innocent lives are not played with just to rake in more profits.